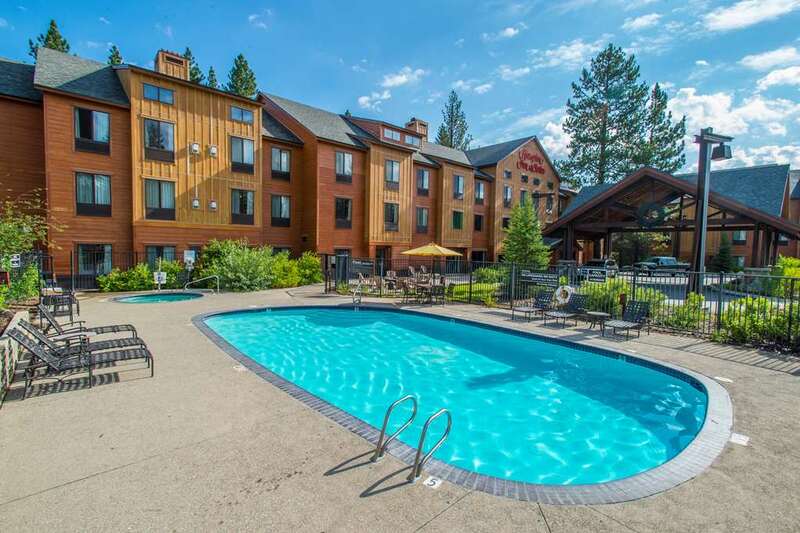 The Hampton Inn - Suites Tahoe-Truckee hotel is located in East Truckee California on Highway 267 /Brockway Road/ adjacent to the Truckee Tahoe Airport. Our hotel is centrally located close to all major attractions /snow and water sports/ and provides a perfect destination for both leisure and business travelers. At the Hampton Inn - Suites hotel standard room amenities include complimentary continental breakfast hair dryer high-speed internet access in all guest rooms and in the hotel lobby and meeting rooms. The staff is very knowledgeable and can provide exceptional assistance for planning outdoor activities. We love having you here at the Tahoe-Truckee Hampton Inn - Suites hotel in California. Blue Coyote Bar - Grill: TRUCKEE*S FAVORITE FAMILY SPORTS BAR Delicious pizza awesome wings juicy burgers tasty sandwiches and fresh salads. Featuring a full bar with 13 beers on tap. Satellite coverage of all your favorite sports on 21 flat screen TVs and arcade games for the kids. Truckee Donner Public Utility Dist.